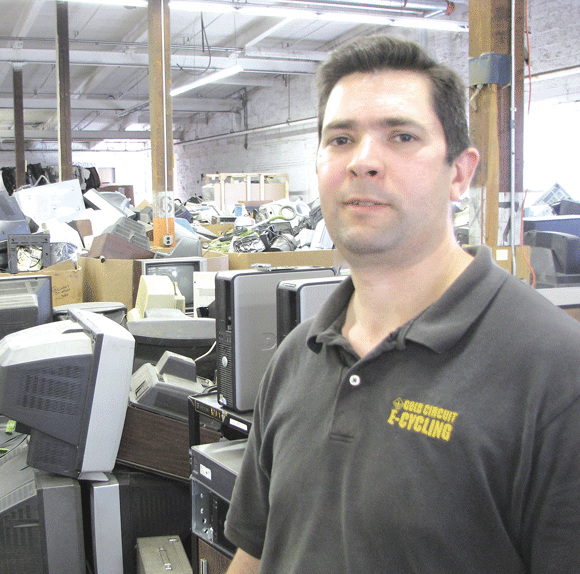 Matt Pronovost says the mission at Gold Circuit E-Cycling is controlled growth. It’s little more than a few wooden shelves in the back of the room cluttered with what could only be described as electronic artifacts, especially if you’re under age 40. There are a few 8-track players in the mix, two movie projectors, a ’60s-era console television (a model that sat on the living room floor), a turntable, an old Atari system, several beta camcorders and transistor radios, and maybe a half-dozen rotary telephones of various colors and shapes. And then, there are the computers, most with brand names and model numbers that achieved fame (or infamy) but disappeared from the landscape decades ago. A Commodore 64 sits between a Digital UT102 and a Radio Shack TRS-80 Model III microcomputer. All three probably came out of the box 30 years ago, and they certainly look their age. Pronovost said it takes something really unique to make the wall these days — like the old washboard and basin that came in a few weeks ago — partly due to the fact that he’s just about out of display space. But it’s mostly because he’d rather devote his time to the 99.9% of the stuff that comes in his door that he doesn’t even think about keeping. This is what Gold Circuit E-Cycling is really all about. 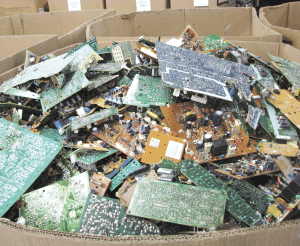 This bin of circuit boards is one of many crowding the floor at Gold Circuit E-Cycling. It’s a three-year old enterprise devoted to the recycling of computers and electronic equipment, an intriguing and fast-growing venture now occupying roughly half of one of the dozens of buildings comprising the sprawling Ludlow Mills complex. And it would seem to be the right business in the right place at the right time. Indeed, as technology advances at a rate so rapid that it seems like a 40-inch flatscreen TV or five-year-old PC might soon be candidates for the museum wall (and there are more than a few of both on the floor waiting to be dismantled and recycled), area business owners and residents are increasingly challenged by the question of what to do with yesterday’s electronics as they acquire tomorrow’s products. And Gold Circuit was created to provide an answer. This venture, which recorded 25% growth in its first full year in business and will likely double its volume this year, collects or ‘demanufactures’ computers, electronics, batteries, home appliances, lawn equipment, metal furniture, copiers, printers, medical equipment, power tools, tires, fluorescent bulbs, styrofoam, pellet-fuel bags, and more, and sells the parts and material for scrap, thus keeping such items out of the waste stream. There are charges for some products that are dropped off at the facility — anything with glass or refrigerant, for example, and tires as well — but many items can simply be left free of charge. And the company is making it even easier by staging collection events, such as one held recently at East Longmeadow High School. Several dozen pieces of equipment arrive at the Gold Circuit facility each day, meaning the company is already essentially at full capacity in a 15,000-square-foot location it moved into just last year after outgrowing its original, 6,000-square-foot home in the Ludlow Mills complex. When, how, and where the company next expands is a critical question, said Pronovost, adding that at present, the goal — and the challenge — is controlled, smart growth. For this issue and its focus on green business, we look at a company that is certainly larger than the sum of all those parts amassed on the Gold Circuit floor. As he gave BusinessWest a tour of his facility, Pronovost stopped briefly at the museum wall — he tried, unsuccessfully, to find a date on that washboard — but quickly moved on to several large cardboard boxes, each destined for a vendor that would recycle the material in question and/or extricate the more valuable materials from them. There was one for clean (as in unpainted) aluminum, a material that will fetch 65 cents a pound, he said, and another for ribbon wire, most of it from PCs. Three boxes contained low-grade, medium-grade, and high-grade circuit boards, respectively, designations that indicate that amount of gold in each one. And there were others for everything from transformers (separated by size) to plastic (one for lighter colors and one for black). Meanwhile, there was a huge box filled with Styrofoam that was used to keep many of these products safe in their boxes. Sold by the bale, this material has a number of potential future uses, said Pronovost, especially as a composite material used in everything from furniture to picture frames. How he came to be an expert on the future lives of such materials — and to create a business focused on e-cycling — is an intriguing story based on the most basic principles of entrepreneurship: seeing a need and creating a service to meet it. “To be honest, I pretty much fell into this,” he explained, while retracing a career that started with work supporting those using computers, not breaking them down into component parts. 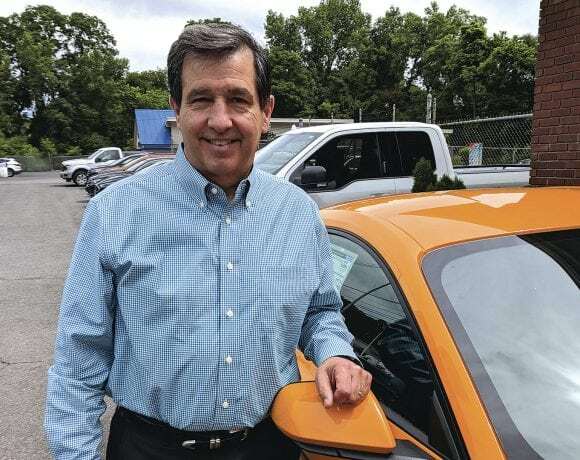 He started in what he called the “desktop-support field,” working at MassMutual for a few years before moving to a firm in Connecticut where he handled hardware setup and configuration work, as well as equipment auditing. As that company was repeatedly sold to larger corporations, with each transaction accompanied by a change in equipment, Pronovost segued into resale of the old hardware and, eventually, into selling parts and material for scrap, an operation carried out in-house. However, the Great Recession changed the equation quickly, he went on, adding that he was one of many to be laid off and forced to settle on a new career path. His was entrepreneurship. Elaborating, he said that there were, and still are, national outfits that would work with large corporations, such as MassMutual and Aetna, to help them scrap electronic equipment, but such operations historically haven’t had much interest in small businesses or residents. Meanwhile, some communities had collection operations (most of them pricey) at their transfer stations, he went on, but there was a definite void in service to large portions of the local market, and this was the need he set out to address with Gold Circuit. He opened the doors in October 2010 and started small, handling the bulk of the work, including most of the demanufacturing, himself. Growth, he noted, has come through awareness — of both his company’s services and the need to seek out earth-friendly ways of dealing with yesterday’s electronic devices. 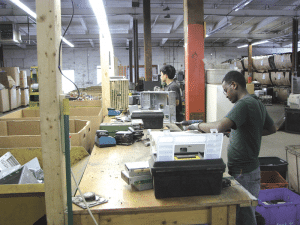 Employees at Gold Circuit ‘demanufacture’ a wide array of computers and electronics, with parts and materials sold as scrap. Using an old laptop as an example, Pronovost said there is a good deal of scrap value in such devices, and his company has become adept at squeezing every cent from them. On the day BusinessWest visited the operation, there were several dozen old laptops awaiting their fate. A few of them might actually be sold to resellers if they are in very good condition, said Pronovost, as will the various pieces of equipment — computers, printers, VCRs, phones, air conditioners, toaster ovens, and more — crammed into the 20 or so large boxes on the shop floor. This is a busy time of year — good weather inspires people to clean out their homes and businesses, apparently — and the floor is crowded with “inventory,” he went on, adding that Gold Circuit currently has several days worth of devices to demanufacture, and more comes in every day. Pronovost has tweaked his original business plan slightly, but for the most part, the document’s projections for volume, or weight (400,000 pounds of material in 2012), revenue, growth, and employment have been on the money. They were based on a number of factors, but mostly the incredibly fast pace of progress with computers, cell phones, and other electronic equipment, and the market for used items — or the lack thereof, as the case may be. Indeed, he said that PCs more than seven years old, and some much younger than that, have little value other than as scrap when their owners decide to upgrade. And the same is largely true for today’s televisions. This phenomenon is one of the many factors contributing to the company’s impressive growth rate, he continued, adding that others include everything from a lack of competition locally to strong word-of-mouth referrals, to heightened efforts in recent years to market the company. But much of it comes down to partnerships, or working with a host of constituencies, from individual communities to area colleges and universities, to encourage responsible disposal of unwanted electronic items. When the town of Longmeadow opened its new high school, Gold Circuit took roughly 12,000 pounds of old computers and other electronic equipment from the old one free of charge, said Pronovost, adding that another example of such partnership-building was the recent collection drive at Holyoke Community College to benefit a scholarship fund at the school. Participants paid a small fee to organizers to have everything from an old cell phone to a garage-cluttering air conditioner hauled away by Gold Circuit. Such events are win-win-wins, said Pronovost, noting that the scholarship fund grows, the planet benefits because such items don’t wind up in area landfills, and Gold Circuit gains some invaluable exposure. Looking ahead, he said the company, which now has four full-time employees, and several part-timers, will continue its efforts to chart steady but controlled growth. Pronovost said his museum wall often generates interest and conversation. “People will say, ‘holy smokes, a Commodore 64 — I had one of those back in…,’ and they start adding up in the years,” he said, adding quickly that, while nostalgia is fine, it’s not what this business is all about. Instead, it’s about meeting a growing need among area businesses and communities, and a desire to do the right thing when it comes to disposing of old equipment, styrofoam, and more.